Links for stories about women and the particular difficulties they face in Haiti can be found here on Trailfire. The Sun reports that orphans are falling prey to child-trafficking gangs. 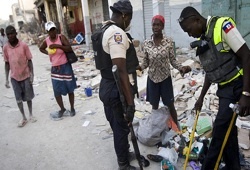 The United Nations mission in Haiti has also said it is concerned that gangsters and child traffickers will try to exploit Haiti’s chaotic social conditions.